This has been a hard week. Hard for us as a nation. Hard for many of us on a personal level. The sight of world leaders laughing in response to statements by our President about his accomplishments and this great country. Scorn and anger I have seen before, but never laughter. Then the anticipation and media buildup to the Senate Judiciary Committee session on Thursday. Headlines about new allegations of sexual misconduct. Speculation about who would say what. Predictions about the fate of the Supreme Court nomination itself. I would guess that many of you, like me, watched the hearings on Thursday. I listened as Christine Blasey Ford described in painful detail her experience of sexual assault as a teenager. I listened as she responded to questions, again and again, reliving her deeply emotional experience. Its lasting effects that have shaped and affected her life. Her emphatic statement that the person who attacked her was Brett Kavanaugh, and her affirmation that she was 100% sure of that identification. As I heard and saw her pain, I could not help but think of all the women, and some men as well, who have experienced sexual assault or harassment. The social movement known as #MeToo that has emboldened women to come forward and share their experiences. We know there are many of them. I thought too of women who, for reasons of their own, have remained silent. So many stories. So much pain. I could feel my body tensing up, an ache forming around my heart. A feeling that would stay with me through the rest of the day. Then, in the afternoon session, it was Brett Kavanaugh’s turn to speak. I listened to his anger at the damage caused to his family and to himself by the accusation leveled against him. His indignation at the possible denial of a position to which he felt entitled because of his background and his accomplishments. I heard his insistence that he was not present at the gathering described by Dr. Ford. The actions that she described were not his. His denials of statements from others about his drinking habits and their effect on his behavior. His declaration that he was 100% sure that he was not guilty of sexual assault. And then, there was the whole political scene. We witnessed senators criticizing actions and lack of actions that had led up to the hearing. Democrats and Republicans alike made self-serving speeches about their own role in that process. They pointed fingers and leveled barbs at each other. At times they seemed more interested in going after each other than focusing on the two people testifying before them. It was partisanship on full display. Deeply disappointed and angry, I wondered when we would ever hear the term “bi-partisan cooperation” again. A glimmer of hope came when it was announced that the two sides had agreed to request further investigation and the confirmation vote would be delayed. So where are we? What are we to do in the midst of these events in our national life? As citizens, we can vote. We can send letters to our Senators and Representatives. We can demonstrate? But what else can we do? What can we do as people of faith? We have come here this morning to gather as the faith community of St. Augustine’s. 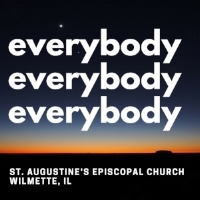 Committed to living out our recurring theme: Everybody. Everybody. Everybody. This parish is part of the wider Episcopal Church whose Presiding Bishop Michael Curry insistently and persistently reminds us to keep our focus on Jesus. Jesus. Jesus who commands us to love our neighbor. With “Everybody, Everybody, Everybody” at our core, we pride ourselves on our hospitality. We welcome familiar faces and newcomers as they walk into this place on Sunday morning. We invite all who are here to share the Eucharistic meal of bread and wine. We strive to understand “neighbor” in the broadest sense: people we know and people we don’t know. People with whom we have a relationship and those we encounter for the first time. People who look like us and people whose skin color or ethnic background is different than ours. What if we stretch ourselves, to think of neighbor in another way? What if we begin to look at people we meet differently? As I watched the events and heard the stories on Thursday, I remembered something I learned from a friend not long ago. He told me the story of being in the car with his mother. He was sixteen years old and had just gotten his license. He was driving. In front of them was an elderly woman going slowly, well below the speed limit. Frustrated and impatient, he shouted, “Come on, lady, get a move on! I don’t have all day.” His mother snapped at him, “Hold on there! You have no idea what is going on with that woman. She might be on the way home from the hospital where her husband has just died. She could be struggling to hold herself together so she can make it.” He said he never forgot what she said to him. Since then, he has tried to be aware that anyone he meets—at any time, in any situation—may be carrying heavy burdens that he knows nothing about. What if each one of us, with intentionality and self-awareness, began to look at people with that kind of lens? What might be going on with them that we cannot see or know? What if we carry in our own hearts an openness and a deep care for the whole person of everyone we encounter? What if our facial expression, our tone of voice, our words of greeting express what is deep in our hearts? I see you as a person of value. I care about you. I am ready to welcome you. To listen to you. To walk with you. Sadly, we know from Christine Blasey Ford’s testimony in Washington the kind of pain someone who has experienced sexual assault carries within them. We know it from her story. We know it from the voices of demonstrations and marches, from stories we have heard and, perhaps ones we have lived, that such experiences are widespread. People carry all kinds of pain. We need to always be aware of that and care for them, however we can. We know so well from the stories of Jesus’ ministry that it started small. His mission was carried forward by the actions of a group of disciples, starting with just twelve and probably increasing to larger numbers. In time, Jesus drew big crowds, but the core of the work that produced growth was small, individual actions. Those small actions add up. They begin to change things. Eventually they build something big that has significant impact. That is what our own commitment to openness of heart and the actions that express it could do. Who knows what we might build? Who knows where it might lead us? Focus. Keep focused on Jesus, Bishop Curry tells us. Jesus often had to remind his disciples of the same thing. To keep focused. In last week’s Gospel lesson, the disciples were talking among themselves about who was the greatest. Jesus reminded them that if they wanted to be first, then they had to be last. They were to be servants and serve everyone. In today’s lesson, the disciples are fretting because they have seen someone they do not know casting out demons in Jesus’ name. They want him to put a stop to it. Don’t worry, Jesus tells them. “Whoever is not against us is for us.” A person performing acts of healing and love is helping the ministry he started. They are helping it grow and move forward. That is just fine with Jesus. Using the everyday image of salt, Jesus works to get the disciples focused. Salt is good. It makes things better. In Jesus’ time of no refrigeration, salt preserved food. It was essential to life. Have salt in yourselves, Jesus tells them. Be salt and be at peace with each other. What Jesus doesn’t say here, or at least it isn’t recorded, but I can imagine him saying is: “Be strong. Now there’s work to be done. Get going! That is the pattern of discipleship. The pattern of those early disciples and of us, as disciples in our time. We start out strong. We venture into new territory. We stretch ourselves. Then our resolve weakens or we get distracted. We need to refocus and gather strength before we set out once again. To love and care for one another. To help us gather strength for that work, I offer this prayer, shared with me by a ministry colleague. Let us pray. Holy One, in love you created us and called it good. Grant us the deep wisdom of your love that, wherever this day leads, our lives may remain rooted in your goodness, through Jesus Christ our Lord. Amen.